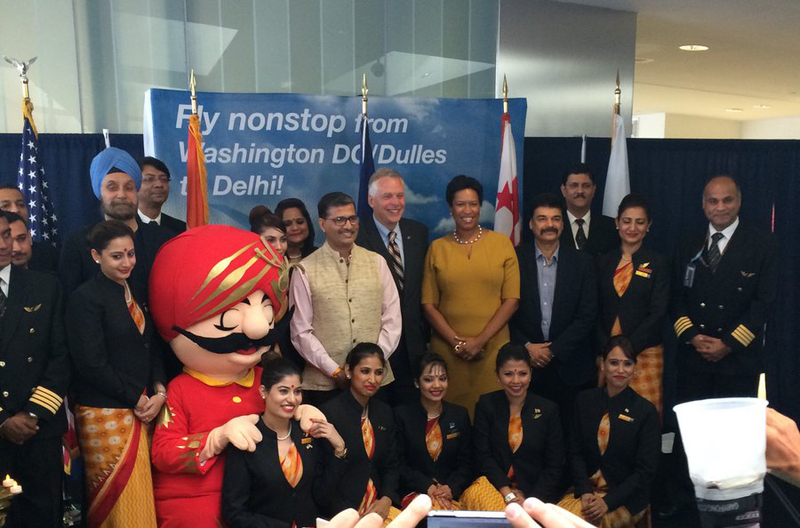 Washington Dulles International Airport and Air India celebrated the first-ever nonstop flight connecting the National Capital Region and Delhi, India, on Friday with delegations from the Embassy of India, the Commonwealth of Virginia and the District of Columbia. The inaugural events, which included a ceremonial water cannon salute, traditional gate-side Indian prayer ceremony, press conference, ribbon cutting and gala luncheon, commemorate Air India’s new three weekly nonstop, roundtrip flights between Indira Gandhi International Airport and Washington Dulles International Airport. Sabre Global Demand Data shows that for the year ending March 2016, the Washington, D.C., area welcomed more than 281,000 Indian visitors-making India the fourth largest overseas travel market for the region. “With international visitation between India and the Washington, D.C., area expected to double by 2025, the Airports Authority’s partnership with Air India, the Commonwealth of Virginia and the District of Columbia is just one way we’re working to enhance the level of service offered at Dulles International,” said Jerome L. Davis, executive vice president and chief revenue officer of the Metropolitan Washington Airports Authority. Flight service between Dulles International and Delhi is also estimated to bring in an additional 30,000 leisure and business travelers and $30 million in total economic impact annually to the National Capital Region. “The Washington, D.C., metro is Air India’s fifth U.S. destination after New York, Newark, Chicago and San Francisco, and it reinforces our commitment to providing the most convenient service between the United States and India,” commented Ashwani Lohani, chairman and managing director of Air India Limited. As part of an effort to stimulate travel to Virginia through Dulles International Airport, the Commonwealth of Virginia approved an incentive package over a three-year period beginning in fiscal year 2018 to support Air India. In addition, the District of Columbia plans to provide incentive funding this year to support the partnership. Tourism marketing support will be provided by the Virginia Tourism Corporation, Capital Region USA and Destination DC. For more information on Air India’s new nonstop service from Dulles International to Delhi, visit flydulles.com. Air India is the flag carrier of India and a member of the Star Alliance group. Air India transports passengers, baggage and cargo across a network of 66 domestic Indian destinations and 34 international destinations in the United States, Europe, Australia, Far-East and South-East Asia and the Gulf. Air India flies one of the youngest aircraft fleets-including the wide-body Boeing B777, B747 and B787 Dreamliner, as well as the narrow body Airbus A321, A320 and A319. Air India plans to operate a Boeing 777-200LR, with eight first class, 35 business class and 195 economy seats, on service to Washington Dulles International Airport. For more information, visit airindia.in. Tourism is an instant revenue generator in the Commonwealth. For every dollar invested in tourism marketing, Virginia Tourism returns $7 in state tax revenue. In 2016, visitors spent $24 billion, which supported 230,000 jobs and contributed $1.7 billion in state and local taxes. To learn more about Virginia Tourism Corporation, please visit virginia.org.